Hairbrush cleaner prevents dull and dirty hair. 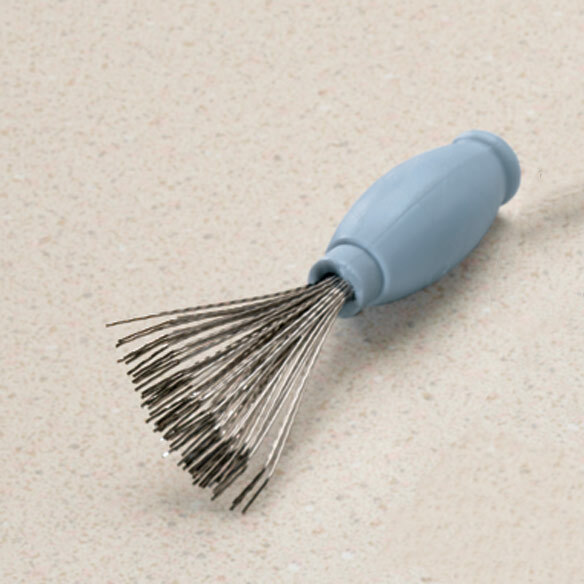 Hair brush cleaner promotes sanitary grooming, with hair tools being cleaned after each use. Special wires on brush cleaner's handle remove stuck hairs and extend brush life; 2 1/2"L.
Hair products must be clean after each use. I have always had a hard time to clean my hair brushes, but not anymore! It is easy to use and my brush no longer has tangled hair on it. I had been using combs, which were ineffective. This is the best little tool every made for a clean brush. WORKS PERFECTLY AND IN SECONDS. Have been searching for this product for ages. We had one when I was growing up. Makes cleaning your hairbrush a breeze. Initial reaction from those that see it - that won't work. But it does - easily & quickly. I'm buying more as Christmas gifts. I was using a small wire comb to clean my brushes but this product does a better job of getting out the lint that collects in a brush. I ordered several of these and gave them to friends. It has really made my life easier. I'll probably order more just to make sure I always have one available. Growing up in the 1950's we would see the "Fuller Brush Man" every month like clockwork at our house ; he would show "us" everything from mops and brooms to personal grooming products. For my 12th Birthday I received my first "real hair Brush" all my own, along with a comb and a set of the comb and Brush cleaners. While in the last 60 years there are no more "Fuller Brush Men or Women" who make house calls the same indispensable Fuller products show up on the "Best" websites so I have never been with out my favorite hair brush and cleaner even though I moved from the West coast to the East of the US. gets both really clean and free of hair. Works best if a finger or thumb is placed on top of wire bristles so they don't accidentally bend. Use short, repeated strokes to remove debris, and clean brush frequently. It actually works fairly well. Many years ago I had something similar to the hair brush cleaner and loved it. I ordered one and even though they are smaller than I would like, they do work wonderful. I only gave the 4 star rating because I feel they should be a bit larger. My mother held onto her little brush cleaner for years, never finding one to replace it. So it was a kick to find this one. Comb cleaner is OK, but brush cleaner (little wire fingers) is GREAT! I'd like it to be a little bigger, tho', like my Mom's was. Great for cleaning long hair out of my granddaughter brushes. Smaller that expected but works very good. I used this brush one time and was pleased with the results. Cleans the hair deep in the brush, to make the brush look almost like new! I use to clean hair brushes only. I easily pull the tines through the bristles of my brushes and clean out the hair. It does a fantastic job but is a little short and almost hard to hold onto to do the job. I said "almost" because I can hold it even with my arthritic hands. The tines are aluminum and would be better if they were less flexible. All in all, it is a great product. I would buy another one if I need one. Wish I would have bought this sooner. At first sight, I was surprised at how small it is, but it works! This product used to be made by the Fuller Brush Co. and it was much larger and much more sturdy. The picture looks the same but is sadly not what I expected because it is too small and flimsy. If this is an example of the other products sold by easycomforts.com I will not buy from them again. Better suited for a doll brush! This item is sooo small it would best be used for a doll brush! Very disappointed with the size of it and the wires bend too easily when you use it on your brush. It cleans some hair out of brush but so did a comb that cost a lot less. Very disappointed/ The wired parts that are supposed to pull the hair out of the brush aren't strong enough to do so. I know that Fuller brush adds their name on the product. This does not. Also, the wires are too frail - they should be stiffer. The price is outrageous. I could have gotten them a lot cheaper at Starcrest of California. Looked like a good deal...but not! Most of my brushes are round & it was hard & time consuming to work it all over. No where the quality expected. I was so disappointed. The handle and wires are too short. Harder to clean brushes, especially thicker ones. Wires need to be longer and maybe even a bit stiffer. The handle is way to short making it harder to hold on to when pulling through brush. The one I had years ago were much better quality. Plastic is okay, but not the rest. It does not work on my brushes. It does not clean out the hair. Brisles NOT LONG enough to reach the base of brush. Flimsy,k soesn't grab hair and lint at base of bruch. I just returned this product today. The brush cleaner pulled out more bristles than hair from my husband's brush. It is a fantastic tool. I need one. And they are hard to find. I have one of these. It is awesome. Actually works great. I just bought one for ten special people for Christmas stocking stuffers. I remember my Mom always had one to clean our brushes and I wanted to have one for myself. I have one and it is great! It is so easy and does a great job removing hair. To make it easier to clean hairbrush. I have had a fuller hairBrush cleaner for over 70 years. It is time to replace! Love it! I've given them for gifts to family and friends--they love them too! This is an old fashioned tool that does a great job and is very handy! No one likes a dirty hair brush! Especially hairdressers. I needed a way to clean my hair brush of all the entangle hair. Need it to help me. This is an awesome gadget! If you've ever used a comb to clean your brush, you'll understand when I say it takes all the little nobbies off the ends of your brush bristles and then hurts your head to use the brush again. Had one of these from fuller brush but can no longer find. I find it hard to clean my hairbrush & so I thought I would try this tool to see if it makes the job of cleaning hair brushes easier! Was looking for something like this to clean hairbrushes. I hope it works !! I saw this a while back and wanted one to get my brushes good and clean. It had good reviews. Mom had one in the 1950s. Works great and haven't seen one in years! It is a necessary item for us ! It looks like what I need to keep my brushes clean!! I hope that this will help clean our hairbrushes without tearing them up like combs do now. I chose the hair brush cleaner because it will make cleaning the hairbrush so much easier, no more brushing hair with hair left behind in the brush! Been looking for something like this to help when I clean my brushes! I have one, my friends like it so I ordered several to give to them. I have always looked for and wanted an easy way to clean my hairbrush. To use on dog brush. I like using this when I clean my brushes.